Wooowee! I bet you're stoked that I got my grubby little paws on something that's only in California. Thing is, I didn't go to California, or even leave the state. Travel that far for an ice cream sandwich? Even I'm not that crazy. Carl's Jr doesn't cross the Mississippi, and his brother Hardee's doesn't venture into "new" territory (new jersey, new york and new england), so I'm out of luck... but not really. There is absolutely nothing stopping me from trying out this great idea at home. Could something go wrong? Yeah probably. Pop-tarts aren't exactly known for their structural integrity, but there are so many possible combinations of poptart flavors and ice cream fillings that I can't help myself. I'm shocked that this has been hitting so many of us as a new idea (apparently in 2010 it was quite the rage). Carl's Jr has gotten themselves a whole lot of free press for this idea, so let's see if it pans out. 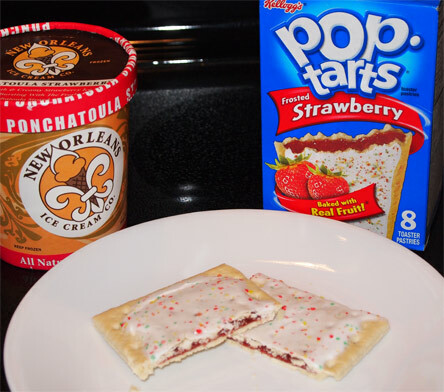 For starters, we're going with a room temperature strawberry poptart and strawberry ice cream. This should be straight forward... or a gigantic mess. I know their sandwich is "hand scooped", but I'm going with a giant slab of ice cream that should help keep things together. I dig in, and yeah, Carl's Jr has a winner on their hands. I like it, I really do. It's just fun. Instead of it breaking apart, the only problem here is that the bottom of the poptart isn't rough enough to hold the sandwich together. However, this is a minor inconvenience considering how amused I am right now. This is fun, and if you don't try this at home, then, well, you're doing yourself a disservice. On Second Scoop: Are you one of those people that deep down fears your pop-tart with go out in a blaze of glory if you stick it in the toaster? Well, I am, but you know I had to go back and try this with a hot poptart right? So I did and man oh man was it the right move. You know how regular poptarts kind of have that unique crusty flavor to them? Toasting turns that down and then amplifies the flavor of the filling which brought this treat up another notch or two. 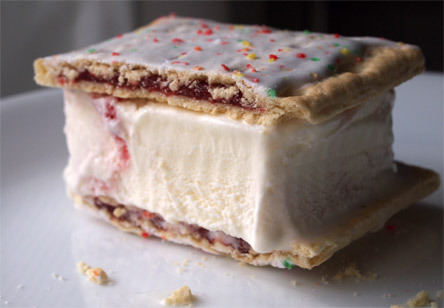 Plus the toasting adds a bit of crispness to the poptart, bringing this more inline with the texture of a standard cookie ice cream sandwich. You need to try this, just keep a few napkins (or kitchen sink) handy. Verdict? Good Idea! Try This! A few years ago a client of mine mentioned doing this, and I greedily imagined two whole Pop Tarts instead of halves ;) Glad to know this is tasty - I will def be trying it hot! I made one of these a while back after seeing it in one of the pop-tart commercials, but I have yet to try it with a toasted tart. That will need to happen soon. I've been "healthy" lately, making sandwiches using graham crackers and ben & jerry's frozen greek yogurt (vanilla honey caramel being the winner so far)It's messy but delicious. The combinations are endless with poptarts. Smores pop tart with Smores Ice Cream. Choco Chip Cookie Pop Tart with B&J Half Baked.